I have just returned from the beautiful sun-splashed streets of Barcelona. Being back in England is, expectedly, depressing yet I am allowing myself to indulge in summer-memories just a little longer by writing a quick review of my time there. I had never visited Barcelona before but friends had lauded it vociferously and I am happy to say my expectations were not disappointed. 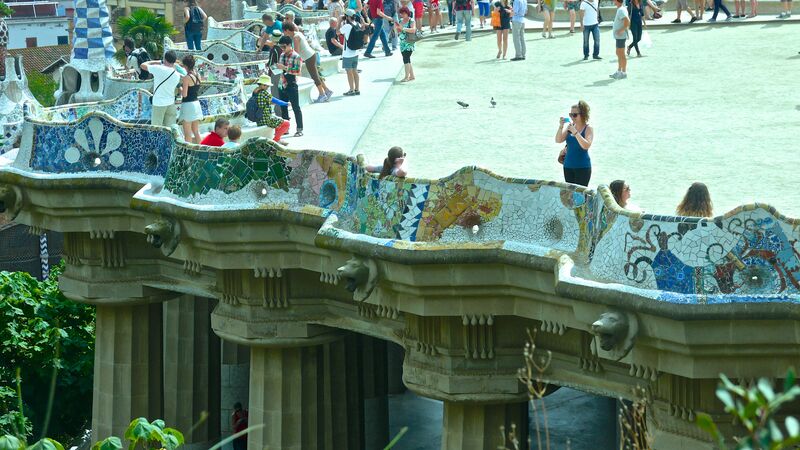 Aside from its beauty and the architectural gems it houses, Barcelona is best characterised by an easy, laid-back charm. Nothing is hurried, everybody lets the day wash over them, in fact I don’t think I saw a single person in a suit the whole time I was there. This may not be doing wonders for their economy but it does make Barcelona a wonderfully relaxing place to visit! In all I found that it was an ideal place for a quick city break. Having such a culturally vibrant city alongside beautiful expansive beaches means you’ll never be bored. After a morning’s sightseeing head down to the beach and soak up some sun before settling down to a sangria in one of the many cafes, perfect! Tourist examining Gaudi’s work at Park Guell. Although I had an amazing time some of the sites were better than others, likewise with the restaurants. 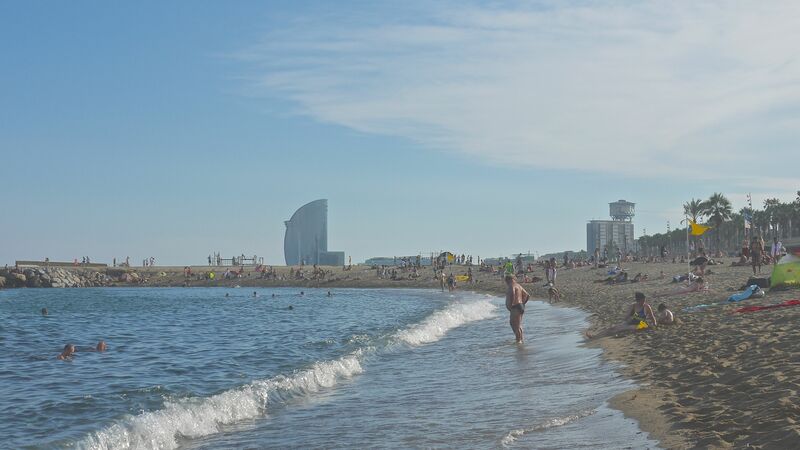 See below my Barcelona Dos and Don’ts and top places to visit. Do drink Cava at every opportunity! it is so cheap even in the most luxurious bars. Don’t be fooled by cheap tapas deals, they can be really hit and miss. The other food at the restaurant may look nice but often the tapas will be of a much lower standard. Do go airbnb. This is the first time I have used it and I thought it was fantastic, so much cheaper and you can save fortune by eating in a couple of times. Do remember that lots of museums and galleries are free on Sundays for a few hours and the first Sunday of each month. The queues are often long but move quickly and its worth it for the money you save. Also a few places will offer you free entry with a student card which is worth remembering. Don’t ever buy drinks at the cafes by the beach. As expected the are ludicrously over priced. We paid €9 for a beer a fanta and a bag of crisps! macba: This is Barcelona’s modern art museum, the building is amazingly beautiful and when I visited the exhibits were also fantastic. They had a feature on the ground floor in which famous works are reconstructed so that the public can interact with them in a new, multi-sensory way which I thought was fascinating. Also this is great place to relax for a few minutes if you need to get out of the sun, their foyer is bright and cool, members of the public are encouraged to stay and use the wifi. All in all it is well worth a visit. 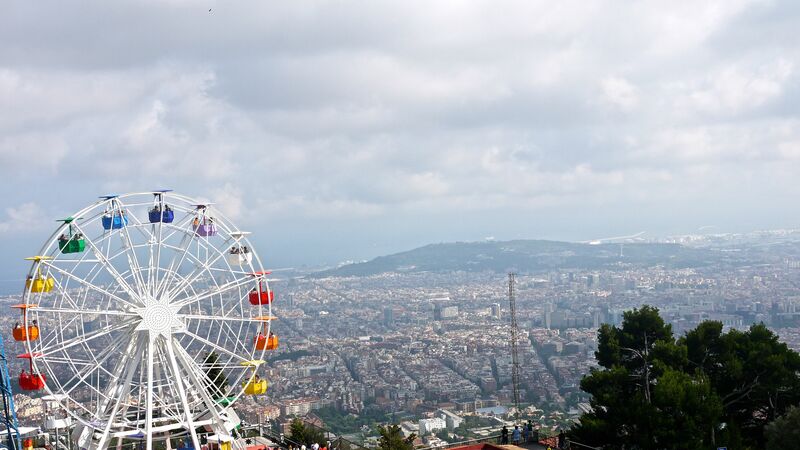 Mount Tibidabo: This is a rest place to visit for an afternoon out, it looks really far way on a ma but the journey is actually pretty quick. Take the old-fashioned tram on the way up but its expensive so I would advise walking down. At the top the views are breath-taking. The cathedral is stunning and well-with a visit. We didn’t bother to pay for the theme park but it looked pretty fun although not necessarily worth €25. Boqueria Market: If you ave time to have to visit this amazing market, even if you are not looking to buy. Despite the throng of tourists gathered by the gate, there remains a huge amount of great quality cheap food on offer. Once you have fought your way through the tourists, make your way to the centre which is a huge fish market. 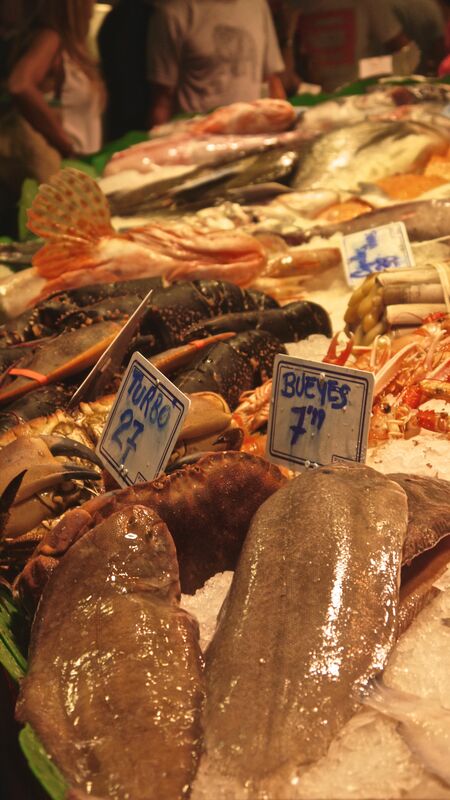 You can buy anything from whole tunas to lobsters and crayfish all fresh and all fantastically well priced. I bought live clams for only £10 a kilo and huge prawns only costing around 10p each!!! A fish stall at Boqueria Market.